I love fountain pens for writing reflectively. But when I'm working, I often wince at the thought of "wasting" a fountain pen on just scratching out some notes or tasks or phone messages or whatever. On the other hand, I've never found a pen - not even the ubiquitous Pilot G2 - that satisfied my note-taking needs. All that has changed, though, thanks to Rotring and, especially, Lamy. One of the things that had always annoyed me about my work journal - in which I keep meeting notes, various tasks, my phone log, etc. - was that it was all in one colour. I would often trawl the web looking for interesting hacks for my notebook, and I would regularly see sample pages written on with inks of multiple colours. It annoyed me. I could really use different colours, but there's no way I was going to start carrying a collection of differently inked pens. But then, one day, while poking around on eBay, I found this: a discontinued Rotring Visumatic. The interesting part was that the seller wrote that he'd put in four new Lamy cartridges because, he insisted in the product's description, Lamy cartridges were the best. I've got plenty of Lamy pens - none of them ballpoints; so I didn't really know if he was right. But here was a sturdy, multicolour pen that might just let me have my cake and eat it too. So I bought it. That was one of the best purchases I've ever made. The pen is well-weighted and balanced, quite solid, and surprisingly thin. It has this amazing mechanism for selecting a colour. You hold the pen horizontally, and click it. Whatever one of the four colour tabs near the top of the pen is facing up, that's the colour of the cartridge that comes out. Want a different colour? Click the pen closed. Rotate it till the right colour is facing up, and click it again. I tell you it's hours of fun for the whole family! The best part, though, is the ink itself. I've never used a ballpoint ink that was as good as the Lamy ink. Not too slippery, but not requiring much force to push either. No scratching on the paper. The line of ink is constant and blob-free. Nice high contrast for all four colours. I swear, I'll never use another ballpoint ink again. Now, these Rotring pens are rather rare. I've never seen one before - or since - on eBay. 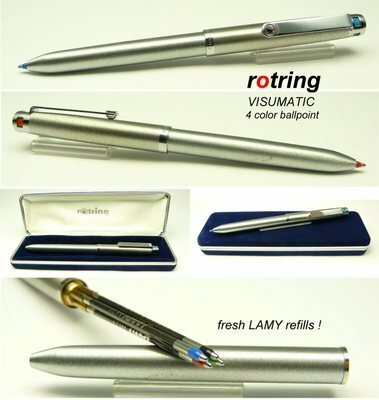 But there are many four-colour Rotrings on eBay, and Lamy still makes four-colour pens, so it's quite possible to find one that will work well for you. But whatever you do, and no matter how many colours you use, use the Lamy ballpoint ink! Hybrid ink? I can't find what that is, exactly. Makes me think of what we call "gel ink" here. In any case, thanks for the tip; I'll keep my eyes open for them. I would note that gel inks I've already tried, and I find them a little too... slippery. One of the characteristics of a ballpoint pen tip is the degree of friction offered as the tip runs over paper. I find that the Lamy cartridges offer a medium amount of friction that I've not EVER found in other ballpoints - which are all either too slippery or too sticky for me. Very obviously this is a matter of personal taste, so "your mileage will vary."